This streaming news radio show follows in the footsteps of Erik Rush’s hard-hitting written commentary. One of America’s pioneering black conservatives, Erik is known for his willingness to say what needs to be said in a manner that is well beyond frankness. In a time when too many shy away from confrontation due to politically-correct sensibilities, Erik strips away both varnish and chrome and gets to the core of today’s problems. 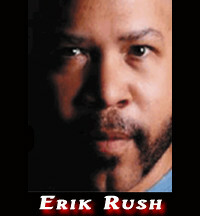 Erik Rush is an author and contributor of social commentary to various print and online publications. He has appeared on Fox News, CNN, and is a veteran of a radio appearances and speaking engagements. In February of 2007, Erik was the first to break the story of President (then Senator) Barack Obama’s ties to militant Chicago preacher Rev. Jeremiah Wright on a national level. His latest book, /Negrophilia: From Slave Block to Pedestal — America’s Racial Obsession,/ is available on Amazon.com and other places books are sold.